Studies performed on artichoke leaf extract have shown that this natural remedy can help lower the cholesterol level of individuals who are healthy but have higher levels of this substance in the body. A study at the University of Reading in UK shows that the artichoke may be one of the top cholesterol lowering foods and a valuable part of any diet. This vegetable is rich in flavonoids and other phytochemicals which help keep circulating cholesterol levels lower and can reduce the risk of cardiovascular disease. Artichoke leaf extract also has a significant amount of vitamins and minerals, which can provide other health benefits as well. For some individuals a cholesterol diet menu may not be enough to lower cholesterol levels significantly in the blood. Since cholesterol is one of the biggest causes of heart disease, heart attacks and strokes, drugs are usually prescribed when cholesterol numbers reach a certain point. The medical studies on artichoke leaf extract offer a new option for patients who are in good health but have elevated plasma cholesterol levels. This plant has been used for other conditions, including indigestion and urinary health, but the new study shows that the artichoke may have many other uses as well. Cynara scolymus, the scientific name for the Globe artichoke, may prove to be more effective at lowering cholesterol than prescription medications. If artichoke leaf extract use is started before the cholesterol level in the blood reaches dangerous numbers then it may be possible to avoid statins and other drugs designed to lower cholesterol completely. 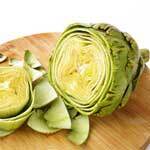 While all of the research and studies are not in yet, the artichoke benefits to health are undeniable. Many scientists and medical experts believe that this plant could be the answer to the high number of deaths caused by cholesterol. Some individuals may have difficulty keeping their cholesterol level under control, and this plant can be very beneficial in these situations.